Photo: F. Scott Schafer/Nickelodeon. © 2016 Viacom International, Inc.
Last year’s Nickelodeon Kids’ Choice Sports was slime-tastic and so epic! Nickelodeon always brings out the most phenomenal masterpieces and their Kids’ Choice Sports is truly one of them. 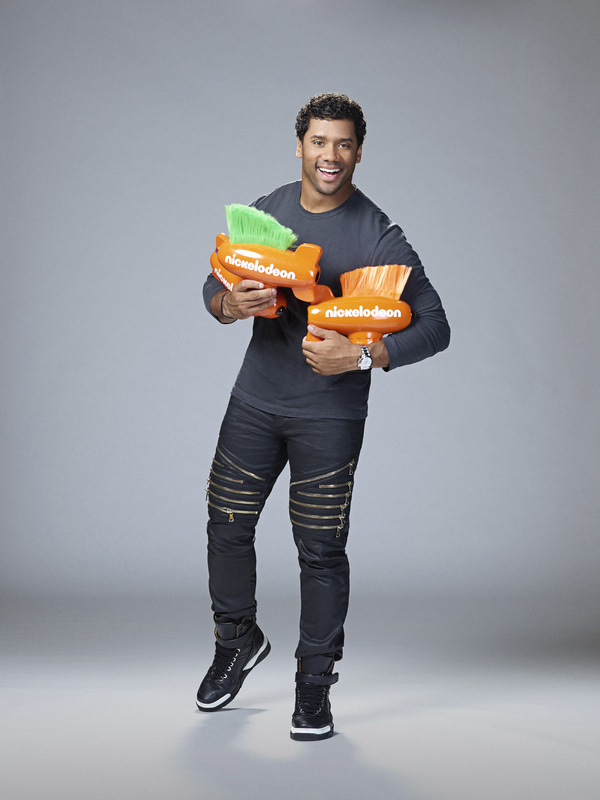 The renowned Nickelodeon has just announced that one legendary football player will be making a touchdown yet again as hosts the 2016 Nickelodeon Kids’ Choice Sports for the second year in a row… Seattle Seahawks’ very own Russell Wilson! This year, the Nickelodeon Kids’ Choice Sports will premiere on Sunday, July 17th at 8-9:30 PM ET / PT. Nickelodeon also announced some of the extraordinary and stupendous athletes that have been nominated at the exceptional award show. Some of the many nominees include Stephen Curry, who garnered a total of three nominations this year, as well as Cam Newton, Rob Gronkowski, Cristiano Ronaldo, Serena Williams, Elena Delle Donne, Odell Beckham Jr., Bryce Harper, Russell Westbrook, Antonio Brown, Von Miller, LeBron James, Ronda Rousey, Alex Morgan, Holly Holm, Usain Bolt, James Harden, Aaron Rodgers, Tom Brady, Lydia Ko, Novak Djokovic, Peyton Manning, Kevin Durant, Carli Lloyd, Kyrie Irving, Lionel Messi, Skylar Diggins, Jimmie Johnson, J.J. Watt, and Katie Ledecky. Today, May 23rd marks the day where YOU can have your voice heard and vote for your favorite athletes to win a coveted mohawk blimp! The power is in your hands and if you want to see your favorite sport stars win, head on over to Nick.com/sports and vote. Nick.com/sports is your go-to spot for all things Nickelodeon Kids’ Choice Sports. Here you can cast your votes for your favorite sport stars, play a new Kids’ Choice Sports game, and see videos and look at photo galleries. You can also head on over to the Nick app to cast your votes. Check out a list of the 2016 Nickelodeon Kids’ Choice Sports nominees below and also an excellent video of Russell Wilson’s Kids’ Choice Sports announcement! We all can’t wait to see what magnificent excitement will be in store at this year’s remarkable award show. Comment below and tell me or tweet me at @alexisjoyvipacc, who would you like to see win a coveted mohawk blimp at the Nickelodeon Kids’ Choice Sports? They are, simply put, the best athletes in the world. Driving the offense or barreling through the toughest defense, they never cease to amaze fans with their athleticism, moves and mastery of the game. In short, the nominees for these two categories represent the best male and female athletes currently competing in traditional sports. Professional athletes make it look so easy that sometimes fans forget the sheer agility required to play with the best of the best–until they see the nominees of this category do their thing. They’re the soccer players with the mind-blowing dribble, the hockey players who can do amazing things on skates or the football players who dazzle us with their fancy footwork. They flip, fly and soar their way into the highlight reels of the X Games and other action sports competitions on the regular, and kids can’t get enough. They’re the death-defying athletes of slopestyle, the BMX racers or the skateboarders who risk life and limb every day to accomplish the impossible. This award honors those players that live life in the fast lane. Whether it’s running, driving, skiing or boarding, these athletes bring the fast and furious to the race. They are the lightening quick speed demons that won’t stop until they’re in first, and the rest of the competition eats their dust. Previous Article: Lilimar And Jaheem Toombs Had A Blast Judging At The Battle Of The Bands! Next Article: Veronica Dunne And Max Ehrich Looked Outstanding At The “Alice Through The Looking Glass” Premiere!